- Silver Hawk news updated. - It is uncertain if Chow Yun-Fat can still star in Hua Mulan. - Silver Hawk roundup: talking about Michelle. - Silver Hawk: two new photos from the wedding battle are added in "Production Photos" (May 20 -22). - See Silver Hawk page for a bunch of photos from Shanghai shooting. WhyNot-You exclusive. - Jackie Chan and Michelle's Police Story III: Supercop makes "Time"'s list of all-time best car/motorcycle/train stunts. - WhyNot-You, the talent agency in Shanghai which is commissioned to cast 60 supporting roles for Silver Hawk, is going to arrange its customers to visit the actual set of the filming, starting this week. Anyone in Shanghai? You may call WhyNot-You at 64450882 to find out more details. - Hua Mulan related: new development on the Korean-Chinese version of Mulan story. - Re-designed the Links section - the oldest page of this site. It was running before other sections were built and it had been hosted on a different server. Now I've fixed some dead links and moved it from my Caltech account to the same server where the rest of the site runs. Anyone who had trouble accessing Caltech server (e.g. visitors from mainland China) should be able to view the Links page now, although some of the articles may still be unreachable if they are hosted on the Caltech server which apparently is blocked in China. - South China Morning Post article on Silver Hawk shooting: Yeoh's Silver Hawk soars over Sars hurdles. Oh dear re the "sprained wrist and a painful back which has left her hobbling a little"!! - Production of Hua Mulan may be postponed to next February. See Hua Mulan page for more details. - Johnny K., the webmaster of "Purple Fascination", invites you to visit his new Michelle site, Love, Yeoh. A very beautiful site with many enhanced photos. The site is in both English and (simplified) Chinese. Though you would enjoy it more if you read Chinese, as many interesting comments are in Chinese only. The best fan site for Michelle from mainland China! - Set photos of Silver Hawk from Shanghai. - The Hong Kong Performing Artist Guild, led by its chair - singer and actress Anita Mui, is organizing a charity event, "1:99 Concert", which will be held on May 24th to raise fund for SARS affected families. Many famous singers agreed to perform. Some artists who are not able to attend the event, including Michelle, Jackie Chan, Sammo Hung, etc., sent in short films to show their supports. The event has already raised HK$12,000,000 before starting. - Silver Hawk shooting update and more cast photos. - Yesterday's "Hollywood Reporter" has an article on Silver Hawk Shanghai shooting. It also has two photos of Michelle in her silver cloak - a small one on the cover and a big one inside the magazine. See Silver Hawk page. Han/Mythical has already sold Asian and European distribution rights to Silver Hawk, as well as rights to Hua Mulan in Korea, Thailand, and France. 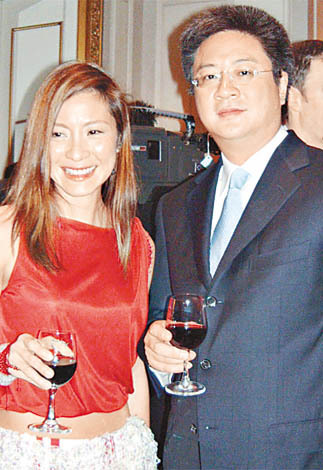 - Re-teaming of Michelle and Chow Yun-Fat in Hua Mulan certainly makes a big news! According to the reports, Jean-Luc Defait's Deal and Pathe have teamed up to buy French-speaking rights to Silver Hawk. Han has also sold South Korean rights to both Hua Mulan and Silver Hawk to Korea Pictures. Hua Mulan is scheduled to go into production on Aug. 22. - Busy shooting Silver Hawk in Shanghai, Michelle is skipping Cannes this year. Thomas Chung, the managing director, and Sabrina Chen, the general manager of distribution at Han Entertainment, are now in France for the Cannes Film Market (started May 14th). Han is currently seeking presales of Silver Hawk, Hua Mulan and Jiang Shi, and the later two are planned to go into production this year. It is official that Chow Yun-Fat has boarded Hua Mulan. The total budget for the three films is about US$53 million. Picture shown is a promotion photo from Cannes. More pictures can be seen at Silver Hawk page. - Silver Hawk: Li Bing Bing battles Michelle. Proof: Wai Lin was supposed to be in "Die Another Day" (commanderbond.net). Wai Lin`s Cut Role From "Die Another Day" (M16). The German James Bond Club (BKD) has a page which shows the screnshots of a part of the script involving Wai Lin, featured in the exclusive documentary "From Script To Screen" on R2 DVD of Die Another Day. - "The Touch" leaves mark on three charities (The Star). - Hua Mulan may be delayed due to SARS in China. - The Heroic Trio will be screened by Cinema program at the Australian Centre for the Moving Image, 7:00PM Thursday May 8, Melbourne. - Presented by Black Belt Theatre, Yes Madam is scheduled to be shown at June 28th, 4:00PM, at Allston Bombay Cinema 2, Boston. - Co-producer Thomas Chung talks about Michelle's motorbike jump in Silver Hawk. - Photo from Shanghai: Michelle with the girl who plays childhood Michelle in Silver Hawk. Read more in Silver Hawk news. - Report: Silver Hawk continues in Shanghai. - Report on Silver Hawk: fighting with SARS. So far things are fine with the Silver Hawk shooting team. But reportedly Jiang Shi, a vampire film to be produced by Michelle and Thomas Chung, may have been affected by the disease. Seven make-up men from U.S.A. were supposed to be in Beijing to work on make-up design in the middle of April. Fearing SARS in Beijing, they postponed the trip to May 2nd, to Shanghai. If they can not make it to China by the beginning of May, producers may have to send people to U.S. to learn certain make-up techniques and the filming may be delayed. - Hua Mulan news update: Location scouting will end soon. Reportedly Chow Yun-Fat has boarded the project. - Follow up on the Silver Hawk shooting: Michelle in Chengdu. - News update on Silver Hawk shooting. - Location scouting for Hua Mulan continues. - There is no news on Michelle's motorbike stunt - either it was shot secretly or has yet to be done.... Some cast photos and reports can be seen at Silver Hawk page. Director Jingle Ma took time off from the shooting in order to attend the premieres of his latest film, Why Me, Sweetie?, which were held at 9th in Hong Kong and 10th in Shanghai. - Tim Yip, who just returned from location scouting, talks about Hua Mulan preparation. - Masked Crusader has been renamed to Silver Hawk. Reportedly Korean singer BoA will perform the film song(s). - Leslie Cheung, a famous Hong Kong pop singer and actor, passed away on April 1st. Leslie Cheung was a good friend of Michelle and also Michelle's co-star in Moonlight Express. Michelle first thought it was an April Fool's joke. She was very sad upon verifying the news. Yesterday a "Ming Pao" reporter contacted Michelle, who was in Beijing shooting Masked Crusader. "Leslie is a very talented artist. It's a great loss," sighed Michelle, "hope he will rest in peace!" Michelle said she would return to Hong Kong for his funeral if time allows her. - Official Jiang Shi Website is up. Filming is scheduled from April to August. Starring Anthony Wong (Chau Sang), Brandon Chang, and Yeung Kei. Photo at left: Michelle at Beijing Ba Da Ling (where a section of the Great Wall lies) (from "UDN". click to enlarge). - Hua Mulan news updated. Filming is scheduled in August. Additional crew informaton. - Masked Crusader: news and photos from the first day shooting. Also additional photos from the Beijing press conference. - The production of Masked Crusader is starting today (March 28th in China)! A press conference was held in Beijing on March 27. Some information on casting, etc. can be read at "Screen Daily". For more details and photos see Masked Crusader news. Know what, Michelle is going to fly across the Great Wall on a motorbike - she's going to do it herself! - On Saturday March 22nd, Michelle returned from Japan, where she had been busy with preparing the shooting of Masked Crusader, to attend a charity golf event for Josephine Siao Fong Fong's Children Protection Fund in Hong Kong. Josephine Siao telephoned Michelle and invited her as a special guest to open the charity game. Ms. Siao thanked Michelle who agreed without hesitation to come to support the event despite her very busy schedule. Michelle said she was moved by Ms. Siao's continuous effort in child protection. The event raised a 6 digit figure for the fund. Photos from "UDN", "Ming Pao" and "Dayoo" (click to enlarge). - Masked Crusader news updated: male lead, etc.. Filming will start this week. - Filming of Masked Crusader will start at the end of this month in Beijing. For more details see Masked Crusader news. 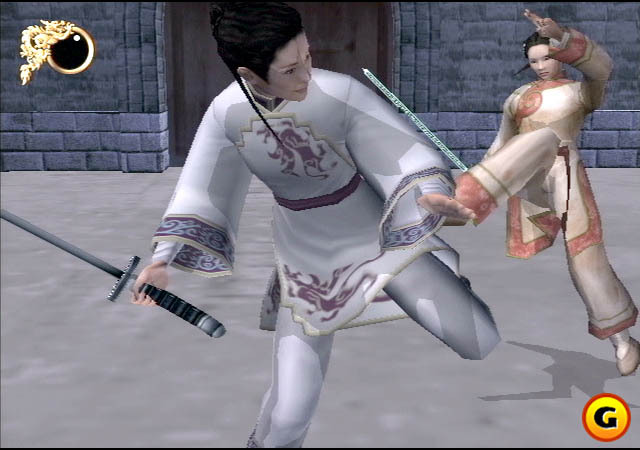 - Crouching Tiger, Hidden Dragon PlayStation 2 game coming this August (thanks Kim). Photo at right: screenshot (click to see full version). - New in Crouching Tiger, Hidden Dragon: wallpapers. It was long overdue, I know ;->. Note: the official website of Crouching Tiger, Hidden Dragon is now at http://www.sonypictures.com/cthv/crouchingtiger. The domain name www.crouchingtiger.com is expired. - Why am I not surprised... Miramax has pushed The Touch back to spring 200*4* (and still no specific release date). Well, I only hope Miramax doesn't get "rewarded" by the rights to Masked Crusader! - Hong Kong actor Anthony Wong (The Heroic Trio, Infernal Affairs, etc.) will star in Jiang Shi, a vampire film which will be produced by Michelle and Thomas Chung. The film will be directed by Law Chi-Leung ( Inner Senses, Double Tap) and it's listed as a HAF (Hong Kong Asia Film Financing Forum) project according to "Screen Daily". - In Gallery->Event Photos: Photo collection of Michelle as a Jury member at Cannes 2002 . - Masked Crusader: cast note and some additional news photos from February 16. - Updates in Crouching Tiger, Hidden Dragon - "Novels": more information about the author Wang Du Lu; some related photos (one has Michelle); the film rights to the novels and a note on the prequel. The second volume in Andy Seto's Crouching Tiger, Hidden Dragon graphic book series was published in January, and the third one is coming out this month. They can be (pre)ordered at Amazon or Barnes & Noble (thanks Paul). - In Masked Crusader: teaser poster at the Shanghai press conference and new title pic. - Masked Crusader Official Website is up! - Some updates at Masked Crusader page. - A photo from last year's Huabiao Award added in The Touch (News Photos). Also a new photo is at News of Jan. 19, when Michelle attended Barney Cheng's fashion show. - In Gallery: redone the "Michelle in LA" section. It was the oldest section of this site (went to public before the site was built). Some stories and more photos are added. - Masked Crusader news: possible deal for the distribution rights, cast note, etc..
- A title picture is added in Masked Crusader page. The cartoon design is from a Han Entertainment teaser poster at AFM. - Michelle is scheduled to attend the 23rd annual American Film Market at Santa Monica, which lasts from February 19 to 26. Han Entertainment will be promoting Masked Crusader at AFM and seeking presales of the film as well as Hua Mulan and Jiang Shi (director: Law Chi Leung). The Touch will be screened during AFM on Thursday Feb. 20, 9:00, NuWilshire Theatre. - Hua Mulan update: producer Thomas Chung talks about the film. - The Touch received two nominations at the 22nd Hong Kong Film Awards: Best Cinematography (Peter Pau) and Best Action Choreography (Philip Kwok). Winners will be announced at April 6th (full nomination list). - Hua Mulan update: Tim Yip talks about the preparation of the film. - A photo of Michelle and the "2003 QQ Star" winner is added at News of Jan. 28. - A "Sing Pao" (Hong Kong) reporter ran into Michelle, who was shopping for clothes at the Central in preparation for Masked Crusader promotion in Shanghai. Michelle said the filming of Masked Crusader was scheduled to start at the middle of March and expected to last three months. The film is unlikely to catch summer release. Photo from "Sing Pao" (click to enlarge). - In The Touch -> "News Photos": some new photos from the Huabiao Awards (Sept.12, 2002), where Michelle received the first award for The Touch. Photos provided by Nancy, a Michelle fan from China, who went through a lot of troubles to record the ceremony and scan the photos for us. Thank you, Nancy! - An interview with Michelle Yeoh, published at "Junior Chamber International" (Jan 3, 2003). Photos from TOYP are added in Gallery. - Video: Michelle at the charity Golf Day, Jan. 8th (2 min 50 sec. in Mandarin and Cantonese. from NetAndTV, 790K). - According to Hong Kong and Taiwan media, Michelle's going back to Malaysia for the Chinese new year (February 1st this year). She has been very busy and didn't have chance to spend time with her family in Malaysia at last Christmas and the new year. Michelle wishes good health for everyone. Her personal wish for the new lunar year is the success of her new film(s). - Michelle was in Changsha (Hunan province) on 27th, on the judge panel of the final competition of China's "2003 QQ Star" (see earlier report on Oct. 31 for more details). 17 year old Guo Binni, who won No.2 "Miss Universe" (China region) last year, was crowned "2003 QQ Star". She will be invited to join Michelle in her next film - Masked Crusader. Also in Changsha were Jingle Ma, the director of Masked Crusader, and producer Thomas Chung. Michelle was in Shanghai last week, where the semi-final of "2003 QQ Star" was held. There were 64 candidates chosen from more than 10,000 participants. Ten finalists were selected. Han Entertainment organized screen tests for them and they may have chance of participating in Han's future films. Shanghai and Tokyo will be the filming locations for Masked Crusader. - Michelle attended the closing ceremony of the 5th Bangkok International Film Festival on 21st of January. Michelle had been practicing martial arts and some special action moves for the upcoming Masked Crusader. Filming is scheduled to start in March and the shooting locations include Dalian, Shanghai, and Japan, where the scenery gives certain feeling of future. Photos: Michelle and Thomas Chung at the BKKIFF closing reception (from "Oriental Daily" and "UDN". click to enlarge). - Photos: Michelle and Brandon Chang attended a fashion show held by designer Barney Cheng, Jan 18, Hong Kong (from "Ta Kung" and "Sing Pao". click the one at left to enlarge). - Hua Mulan related: the current development of Stanley Tong's The Legend of Mulan. - Hua Mulan update: some information on the cast and crew of the film. - Michelle attended Golf Day, a charity activity organized by the Brain Centre Foundation of Hong Kong, on January 8th. 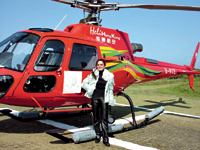 She arrived at The Jockey Club Kau Sai Chau Public Golf Course in New Territories by helicopter. She was very excited and said the helicopter reminded her of the feeling of being Bond girl. Michelle was the special guest to open the game. Despite wearing her high heels, Michelle did two strokes and each time successfully landed the ball into the hole. She admitted to the reporters she was a bit nervous since she hadn't touched golf for 7 or 8 years. The first time she played golf was ten years ago but she didn't have time to continue. Michelle wished everyone happy new year, and good health, success, happiness, love, and peace. She thinks everyday of life is a gift. Good health is the most important thing, especially the brain health. Michelle is a sponsor of the Brain Centre Foundation. Michelle has been very busy preparing her upcoming films. Three films will be shot this year. Two are in mainland China and one is in Hong Kong. Asked about the sequel to The Touch, Michelle said it wouldn't start this year. The script is not ready, plus she has already got a full schedule for the year. - The result of the Bond girl poll from "Hello Magazine": Michelle received a whopping 41 per cent of the vote while the second place, Ursula Andress, got only 16 per cent. See the report from Hello Magazine (thanks Eimee). Happy New Year - 2003 !! !